In my search for understanding the sacred masculine and divine feminine energies better, I recently read David Deida’s book, ‘The Way of the Superior Man’, a modern-day spiritual and practical guidebook for men. From the passion and poetry in the pages, I could tell that Deida spoke straight from his heart, mincing no words on living with meaning, love and purpose. I had recommended it to a client, who, after reading a portion of it, asked me, ‘Does this book imply that all women are irrational’? He also jokingly suggested that there should be a similar counterpart for women (this got my own wheels turning!). In this book, Deida talks about polarity theory, and how chemistry is created between two people when they are oppositely charged. In the ‘ideal’ scenario, in a relationship, a man would be embodying the sacred masculine essence, and the woman, the divine feminine essence. It’s like electricity, which flows from higher potential to lower potential; or magnets, of which the opposite poles attract. When both partners are masculine or feminine in the relationship, the polarity is lost, and chemistry fades. Of course, as evolved spiritual beings, we wear both masculine and feminine hats, but we have the ability to switch as needed in the situation. Tony Robbins teaches this quite extensively in his Life Mastery classes, and most people I have met who have experienced their true essence through these workshops feel awakened and excited about life again. Deida proposes that, at its core, masculine essence is driven by purpose and direction; and feminine essence is naturally drawn to creating more love and partnership in the world. That both of these energies actually complement each other is quite beautiful; and that a single person can actually embody both of these is even more remarkable. Is it so surprising to me now that I have secretly yearned to see more love and connection in the workplace – that it’s the perfect place to foster and grow connection and mutual love and respect? Years ago, I had read books like ‘Nice Girls Don’t Get the Corner Office’ (among other books on women’s leadership), which poo-pooed the nurturing aspects of being a woman – like bringing cupcakes in the office, or putting up personal items at ones’ desk. I followed much of the advice to the ‘T’. I became more aggressive about my professional goals, and less apologetic. I became more purposeful and driven in my communications, focused on meeting deadlines, and would organize 5pm status meetings on Fridays. I also carried this attitude home with me, where I would be methodical and logical in dealings with my partner, while turning on the feminine charm as needed. As you can imagine, this did not win me many brownie points at work or home! Over the last few years, after my ‘awakening’, I have surrendered to the side of me that loves to love, that offers kindness and smiles to others, and focus more on being authentic, offering empathy, encouragement and support to colleagues. I have started to view the workplace as a place to be a better person, to connect and understand each other deeper, and work on my personal challenges, like expressing myself truthfully and skillfully and dealing with difficult people/situations. On a side note, at a retreat last year, I remember offering the ‘lack of love and connection in the workplace’ as a general concern. The answer that I got from a man was, ‘Work is about work and getting a job done – it’s not about love’. I was intrigued by that, and took it as an area for further exploration. That I’m more driven by creating love, understanding and connection in the world, rather than focusing on being an amazingly successful career person or effective marriage partner, seemed to be butting heads with each other. Can all of these be accomplished, through my natural feminine essence, balanced delicately with my masculine energy? Deida provides the metaphor of women being like oceans, and men, like ships, which charter through the ocean, using focus (and, am assuming, a map and compass :). 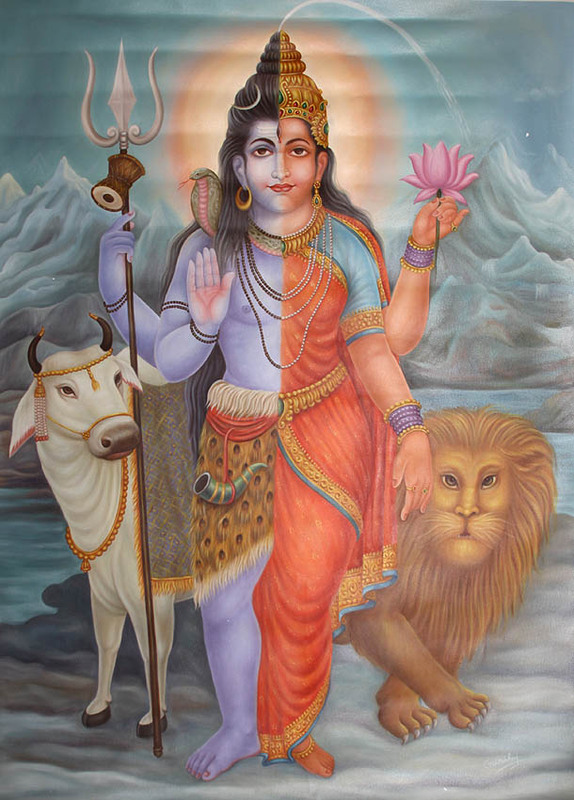 Another analogy that I have heard is that masculine ‘Shiva’ energy is sturdy and solid as a mountain, and feminine ‘Shakti’ energy flows playfully like a river. This is another area that has proven to be both exciting and frustrating. Throughout my life, I have been turning every single stone, taking classes in anything and everything I found fascinating; in school – religion, engineering, environmental studies, language, business – and outside of school and work – yoga, different forms of dance, art, spiritual pursuits, service, shamanism, energy healing, nutrition – you name it! I see potential in everything and (almost) everyone, and I feel like I could create anything, if I were really moved to. Being an ocean of potential, especially as a spiritual seeker, almost feels like nothing I do is enough – that there could be more of everything in the world, as Wayne Dyer shares as part of the seven faces of intention: creativity, kindness, abundance, beauty, love, receptivity and expansion. My feminine side wants to continue to grow, explore and expand in these ways, and yet, my ‘driven’ side asks me to choose a ‘direction or purpose’ in the form of a goal. To accept this idea of being an ocean of potential, to wander through different potential business ideas and interests, is a relief, yet requires a great deal of self-compassion and trust in oneself and the universe. Like flowers, women grow and shine through sunshine, rain and nurturing. What is the need for praise and attention? Just as goddesses love to be worshiped and praised (and people love to worship goddesses), and it has to do with the natural feminine energy of ‘receptivity’, or as in Eastern wisdom, being ‘yin’ in nature. We are meant to be open to ideas, energy, love and kindness, like rivers passing through carved-out terrain; while men naturally carry the energy of action, sense of purpose and direction. As women, it is our duty to praise ourselves and each other; and of course, do so for men as well. Men – this is why women like compliments so much! This is the point that may be sticky for most feminists out there. That women are seen as emotionally messy and vulnerable sounds unattractive – and also, seemingly makes the case that women are unfit for any real stable job. It also implies that men can’t trust women because they are unpredictable. The way I view it is that women are natural holders and vessels of life force and are connected to earth’s and humanity’s energy in a deep way. We are capable of embodying a lot of emotion, not only of ourselves, but of others, which has a healing quality about it. I see it as an enhanced capacity for having compassion for oneself and others, for authentically expressing and transmuting emotions. Deida also talks about how women can begin to sense lack of integrity early on, and are sensitive to people (in particular, men) who are unreliable or aren’t driven by a greater purpose or mission. If a man can successfully deal with (and truly love) women and mother nature, then he is progressing spiritually. While this insight sounds empowering for women in a certain way, to me, it offers the opportunity to learn the skills for authentic communication between two people, to avoid further conflict. While this book was geared for men, I felt like I took away a lot of beautiful (yet potentially conflicting) ways of looking at myself as part of sacred feminine energy, working to create a new paradigm in work and relationships. It has helped foster my interest in encouraging and fostering Divine Feminine and Transpersonal leadership skills through my work, and further spiritual explorations. Thank you so much for sharing this article which is written so elegantly, precisely well. I am born as a dude but have grown more and more sure that my leading energy is the feminine. Even though Freedom is with out a doubt my highest priority in life Love and Connection is just as important to me. Every word of yours resonated with me and I feel exactly the same way. Especially when it comes to your broad interest in many things. Could you explain a bit more in detail how it looks like for you to accept beeing a ocean of potential. How does you way of living look like? Have you chosen to partner up with a masculine leading energy person (man/woman)? I’d love to hear from you and how your understanding and living of this knowledge has evolved over the last years.